The Tennessee Unit resides at Tennessee Tech University in Cookeville between the Tennessee River and Cumberland River. Tennessee is home to one of the most diverse freshwater fish and mussel communities in the world, including numerous imperiled species. 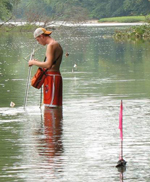 The Tennessee and Cumberland river systems have more than 30 impoundments ranging from coldwater, oligotrophic systems to warmwater, eutrophic systems, each with important sport fisheries. In addition, many impoundments also support popular coldwater tailwater fisheries. Tennessee also has thousands of miles of free-flowing streams and small rivers. With this overwhelming diversity of aquatic fauna and resources in Tennessee, the Unit does not lack for research topics. Hrycik, AR, PD Collingsworth, MW Rogers, SC Guffey, and TO Hook. 2017. Seasonal structuring of yellow perch trophic indicators outweighs spatial structuring in a large lake basin. Journal of Great Lakes Research. Kraus, R.T., C.K. Knight, A.M. Gorman, P.M. Kocovsky, B.C. Weidel, M.W. Rogers. 2016. Developing Fish Trophic Indicators of Climate Change for the Great Lakes. Final Report to the Department of Interior Northeast Climate Change Center and Great Lakes Landscape Conservation Cooperative. IP-075680.